The event welcomed over a million revellers in Downtown Dubai, Emaar’s flagship mega-development in the heart of the city. A highlight was the special tribute to the late Sheikh Zayed bin Sultan Al Nahyan, the founding father of the UAE, whose birth centennial was observed in 2018 as the ‘Year of Zayed’. The Emaar NYE 2019 show’s social media campaigns reached over a billion users, complemented by Emaar’s partnership with TikTok – the leading global destination for short-form mobile videos. TikTok marked its launch in the UAE with a special LED display on Burj Khalifa in the early hours of the New Year’s Eve Gala. 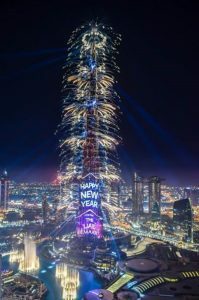 Emaar NYE 2019 was one of the world’s most-watched New Year’s Eve celebrations telecast live globally and live-streamed on mydubainewyear.com, reaching billions of people. The illumination of the façade of Burj Khalifa also earned it two additional Guinness World Records – for the ‘Largest LED-illuminated façade’ and the ‘Tallest LED-illuminated façade’. The Emaar NYE 2019 was also a statement on the positive partnerships that the UAE fosters. The event was supported by governmental entities including the Roads and Transport Authority, Dubai Police, Dubai Health Authority, Dubai Civil Defence, the Department of Tourism & Commerce Marketing, among others. Visitors arrived from around the world to join in the celebration with hotels in the vicinity reporting hundred per cent occupancy. Following Emaar’s partnership with TikTok, five lucky couples from China, India and the Middle East were flown in to Dubai to be part of the spectacle in addition to 55 top global influencers who promoted the Emaar NYE 2019 Gala to their followers. Emaar also selected two lucky winners of their social media competition to enjoy the celebration from a helicopter. Further, as part of the Burj Wishes campaign, several New Year messages submitted by the public on Emaar’s Twitter, Facebook and Instagram feeds @EmaarDubai using the hashtag #2019MakeAWish were displayed on Burj Khalifa’s façade. The much-awaited Emaar NYE 2019 show, themed ‘time and progression’, was accomplished using advanced software and involved thousands of hours of work. The pyrotechnics were put together by a team of over 40 professionals, and over 250 experts worked on the laser and light show. Inspiring visuals celebrating the heritage of the nation kicked off the event which went on for eight minutes on the Burj Khalifa’s LED façade. Adding to the allure was the performance of The Dubai Fountain, the longest show to date of the water-music spectacle. The laser shows underlined the achievements of the UAE, celebrated the life of the late Sheikh Zayed, and featured visual renditions of the UAE’s Mars Mission – all set to engaging music compositions, specially composed for the event. The Emaar NYE 2019 Gala reached its feverish pitch as the countdown to the New Year began. In an all-out display of spellbinding pyrotechnics that deployed over 9,400 fireworks with an active weight of 1,371 kg and fired from 2,017 positions, the UAE, Dubai and Emaar wished the world’ a ‘Happy New Year’ with the message relayed in Arabic, English and Chinese. The experience can be re-watched online at mydubainewyear.com. Emaar will also showcase a short version of the LED and laser shows from January 1 to end-March to delight visitors to Downtown Dubai.